Since opening to the public as a nature park in late 2015, Masungi Georeserve in Baras, Rizal has attracted nature-lovers with its 1,600 hectare forest dotted by 60-million-year-old karst formations. It always comes as a surprise to find a lush rainforest ecosystem like it only an hour’s drive from Metro Manila. Originally intended to be developed into a government housing complex, the deforested area off the Marinina-Infanta Highway (Marcos Highway) was overridden by stone quarrying and illegal logging in the 1990s. Fortunately, the initial plan was shelved, and the management decided to rehabilitate the area and transform it into an eco-tourism destination that protects unique flora and fauna, including many endemic species big and small. Among unique plants found in the park are titan arum, one of the world’s largest flowers, and the purple-flowered vine, Strongylodon juangonzalezii, discovered by science in 2015. The Asian palm civet cat, Philippine long-tailed macaque and the Northern Luzon giant cloud rat also call Masungi their home. The night trail starts at sundown, and takes three to four hours to complete. To explore the park, visitors take a guided hike down the Discovery Trail, following an established path that weaves through the forest, climbs stone pinnacles called Ditse (Older Sister), Nanay (Mommy) and Tatay (Daddy), and traverses cable bridges and rope courses inspired by nature such as a hanging shelter called Patak (Droplet), a canopy walk called Duyan (Hammock) and cliffside climbing net called Bayawak (Monitor Lizard). Ropeways and bridges are dimly lit with LED lights to guide hikers safely along the trail. Obviously, there are no views to be had at night, but portions of the trail were photogenic – thanks to creative lighting. Sections of the Discovery Trail are beautifully lit with small LED lights, outlining the shape of the bridges, walkways and lookout points. A giant spider outlined in LED lights guards Sapot, a giant web of cables suspended over limestone rocks that serves as viewing platform over the georeserve. Another photo-worthy spot at night is Sawa (Python), a tunnel bridge with a snake’s fanged head as an entryway. The lights aren’t just for decoration, as they serve as markers that will guide you safely across the trail. As soon as you step into the forest, you’ll be overwhelmed by the cacophony of sounds made by insects, frogs, bats and birds, which seem louder at night than during the day. You’ll be accompanied by expert nature guides who can even identify animals by their call, telling the difference between a scops owl or the endemic Kalinga narrowmouth toad (Kaloula kalingensis), whose hoot-like croaks are amplified by the hollow rocks where they live. The hammock-like ropeway called Duyan was the perfect place to lie down and listen to the soundtrack of the rainforest. With less light pollution, the stars can be better admired – especially on a clear, cloudless night. Duyan, Sapot and Tatay were the perfect spots to go stargazing. Aside from the stars and the afterglow of sunset, the distant horizon was illuminated by the city lights of Metro Manila, reminding us just how close this nature sanctuary is to the ever-growing metropolis. Watch the sunset, the city lights and the night sky from Sapot. We take a break around a campfire, enjoying grilled sausages and kayumanis tea. Before climbing Tatay, our group took a rest at Tagusan, a rock shelter at its base furnished with hanging chairs and lit up by flickering light of a campfire specially prepared by the park’s staff. We sat around the open fire, enjoying skewered homemade sausages and vegetables, and a hot cups of kayumanis tea, specially made from the sweet-smelling leaves of a medicinal shrub (Clausena anisum-olens) found in the forest. Bioluminescence is the production and emission of light by a living organism. You might have observed this before while swimming in the sea at night, seeing glowing particles in the water, which are actually microscopic plankton, or witness the flashing glow of fireflies in the mangroves. We did see a few fireflies along the way, but what was more fascinating was spotting a small cluster of bioluminescent mushrooms on a decaying tree branch hanging high up the forest canopy. It was my second time to see glowing mushrooms after seeing similar ones at The Pitcher Plant Farm in Bukidnon (see photo). Above the glowing mushrooms, we nearly missed a brown wolf snake, if it hadn’t slipped away, disturbed by our headlamps. Aside from different kinds of snakes – including the venomous Philippine pit viper and Philippine cobra (so be extra careful!) – other critters become active at night. Snails and spiders of different varieties were the most common sight, including endemic Helicostyla annulata snails. We saw box spiders, huntsman spiders and a reddish one as big as a palm! Snails are more active at night – like this Helicostyla snail endemic to the Philippines. We spotted different kinds of spiders, like this box spider busily spinning its web. It’s not just little critters that become active at night. If you’re lucky enough and hike quietly, you might just encounter bigger and rarer animals along the trail. While we hung around at Sapot, one of the guides noticed something rustling in a nearby treetop. What he thought was a monkey turned out to be a Northern Luzon giant cloud rat (Phloeomys pallidus), locally known as paroot, traversing a large branch! It was the first time any of the guides spotted one along the Discovery Trail. The animal – endemic to the island of Luzon – didn’t stay around for long and soon disappeared from sight, but we were elated to have caught a glimpse of it in the wild. Other large animals you may encounter at night would be the Asian palm civet cat and monitor lizard. 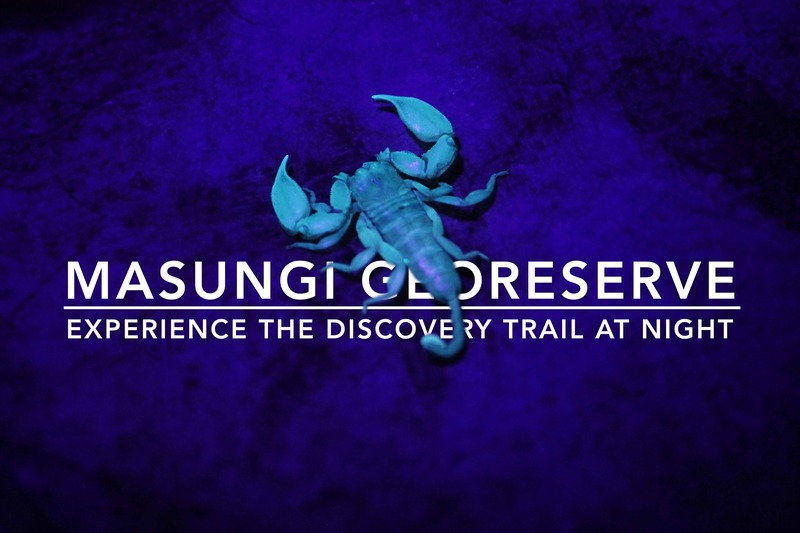 Like their day visits, the Discovery Trail at Night must be booked in advance through Masungi Georeserve. Night trails are currently open only to groups of seven to ten people, with conservation fees of PHP 1,500 per person for weekdays and PHP 1,800 per person for weekends. Only limited slots are available for now. The night trails start at 4:30 PM and 5:30 PM, and take three to four hours to complete. Visit their Facebook page for the latest news and updates. During the day, it’s possible to commute to Masungi Georeserve from Cubao, Quezon City, taking a jeepney or FX to Cogeo Gate 2 / Padilla in Antipolo City, where you can take another jeepney to Sampaloc, Tanay. Alight at the entrance to Masungi Georeserve, along KM 45 of the Marikina-Infanta Highway. For the night trail, however, it’s best to get there and back in a private vehicle, as there’s no public transportation when the hike ends around 9 or 10 pm, and any sort of accommodation where you can spend the night at the site, as of now. If you need to overnight after the hike, I recommend checking out hotels or resorts in Antipolo City or Tanay.